I don't know what possessed me to make this meatloaf. I don't even like the taste of real meatloaf. I remember as a kid when my mom would make her weekly meatloaf. Out would come the bottle of ketchup and the loaf of bread. My mom would save the end pieces of the bread to use in her meatloaf as we 5 kids would not eat the end pieces. I thought the way my mom made meatloaf was quite disgusting, she would mix the gross hamburger meat with the bread and ketchup along with eggs with her hands. Then she would stuff into a pan and place bacon on top. The thing looked quite gross before it was cooked and afterward it still looked nasty to me but my dad loved meatloaf so she made it once a week. Maybe this is one of the reasons I choose not to eat meat as I never quite liked the taste of ground beef. My husband does enjoy meat and craves meatloaf once in a while. 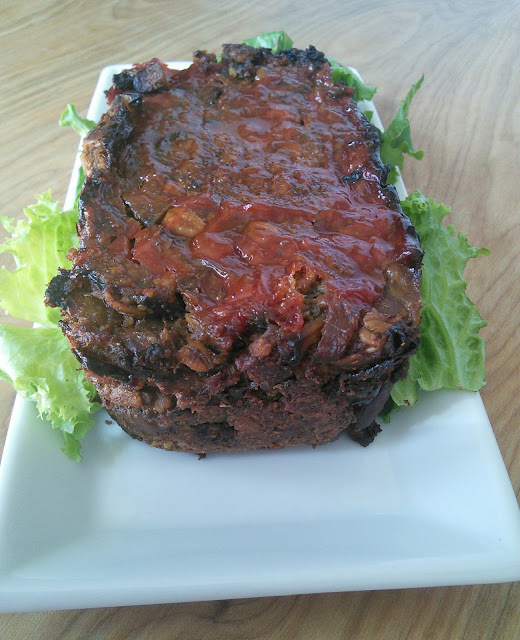 So when I saw this recipe for a vegetarian "meat" loaf, I just knew I had to make it for him. The picture of the mushroom "meat" loaf looked like the real thing so I thought maybe he just might enjoy this vegetarian loaf. Lucky for him, I even had a bottle of ketchup in the fridge from the last Cub Scout event. This "meat" loaf was a hit with my husband as he was skeptical when I told him it was made without meat. I made this into two small loafs and a tiny one to taste before I took the pictures. I gave my husband a taste and he wanted more. I told him I had to first take pictures. My husband then said, "hurry up and take the picture" but I couldn't as it was night time. 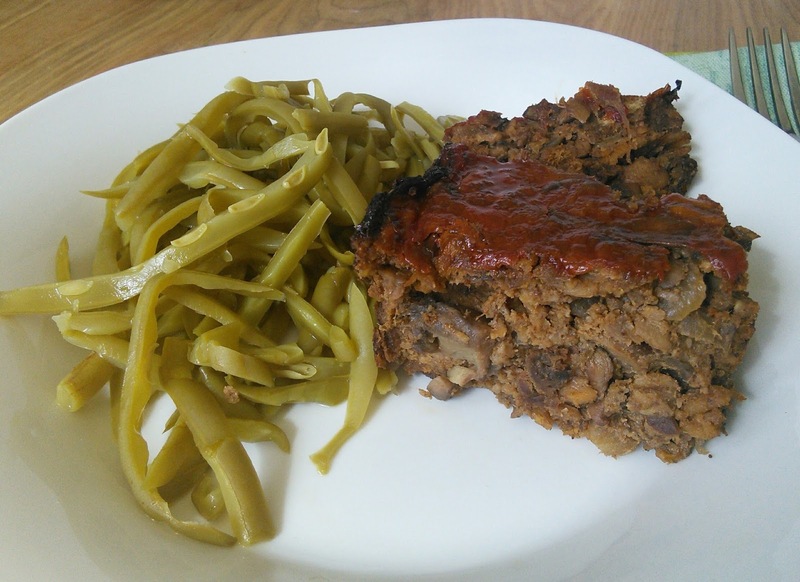 My husband then whined "you can take it at night time" as he wanted more of the delicious "meat" loaf. I even loved it and it tasted so much better than the meatloaf that I remember as a kid. This is a recipe that I will make again. It does require some time to make it and bake it but it was so worth it. 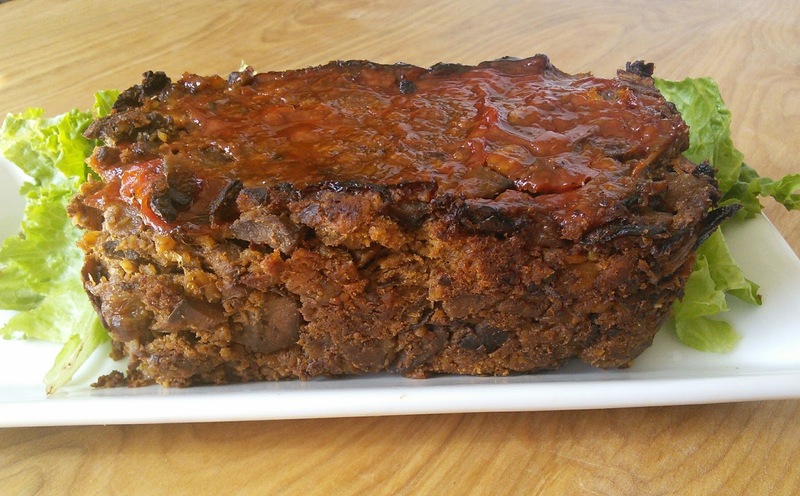 The next time mushrooms are on sale I will be making this delicious mushroom "meat" loaf. 2. In a large fry pan heat the olive oil over medium-high heat. Add the onions and cook until lightly caramelized, 3 to 4 minutes. Add the mushrooms and cook, stirring often, until any liquid released has evaporated and the mushrooms are lightly caramelized, 10 to 12 minutes. 3. Add 1/2 cup of the ketchup with the sage, thyme, oregano and garlic, and cook, scraping up any brown bits from the bottom of the pot until the garlic and herbs are fragrant about 2 minutes. Remove from the heat and stir in the bread, walnuts, oats and bread crumbs. Transfer to a large bowl and let cool slightly. 4. Using a wooden spoon, stir in the salt, lemon juice, pepper, lemon zest and eggs until well incorporated. Press the mixture into a greased 9-by-5-inch loaf pan and smooth the top. Brush with the remaining ketchup. This looks wonderful! We're always looking for alternatives to meat! I would definitely try this recipe. We like to eat vegetarian at least once a week. Yummy! Vegetarian recipes are always so delicious. I'll try this one! Oo this looks amazing! I love meatloaf. I'd give this vegetarian version a try. This looks like a nice meal. Might try it out. I have never had a vegetarian meat loaf before. This sounds like a great dinner to try out. This actually looks really good! It looks like real meatloaf! This looks delicious! I love having meatloaf, but making it vegetarian would be so much better. I need to give this recipe a try. I definitely would try this one at home. My kiddos would be so thrilled. Would not want to let them know this is made up of veggies. . I will try to copy this recipe but will incorporate some meat for my kids to enjoy. I can go with the pure mushroom meat loaf. This is a good vegetarian option. But I agree this still looks gross, though it may taste good. What a pleasure it will be to make a vegan version of this family favorite from my childhood. I am so delighted that you shared this healthy and delicious Vegetarian Mushroom "Meat" Loaf with us at the Plant-based Potluck Party. I'm Pinning and sharing this!